The cost of electricity is in the news once again with the move by supplier npower last week to increase prices by 15%, arguing that higher wholesale prices together with increased non-commodity costs could no longer be absorbed by the supplier. Last week also saw the Early Capacity Auction close at a price of £6.95 /kW, over three times higher than the Supplemental Balancing Reserve it replaces, so are consumers facing a period of higher energy costs and if so, what might the impact be? What makes up electricity bills? Electricity bills reflect the costs of delivering the electricity to users in accordance with the Government’s energy policy. That means that in addition to the cost of acquiring electricity in the wholesale market (where prices are based on the marginal cost of generation) and the supplier’s operating costs and profit margins, electricity bills also include the costs of delivering electricity, ensuring security of supply, de-carbonising the sources of electricity, and various efficiency-related schemes. 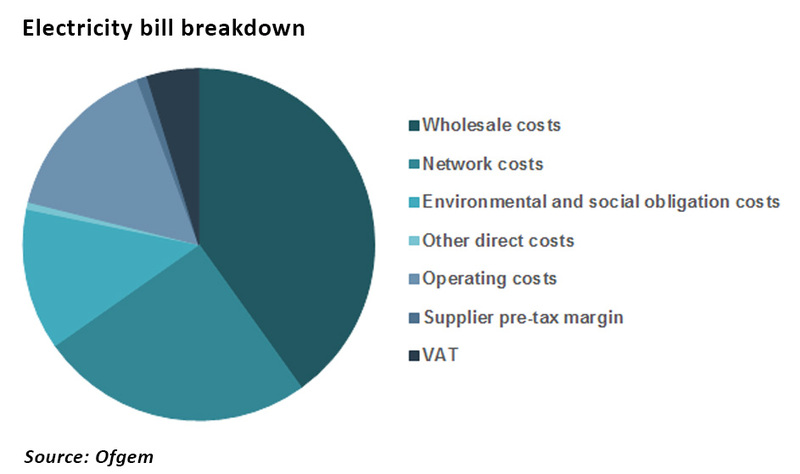 As can be seen from this chart provided by Ofgem (derived from the data provided by suppliers via their Consolidated Segmented Statements (“CSS”)), only 40% of the bill price is due to the wholesale price of electricity, with 38% being due to network and environmental costs. The environmental and social costs category includes: Renewable Obligation Certificates (ROCs); Feed-in Tariffs (FITs); Contracts for Difference (CfD) under Electricity Market Reform (EMR); Capacity Market (CM) under EMR; Energy Company Obligation (ECO); Administering government social schemes such as the GER and the WHD; Levy Exemption Certificates (LECs); and Assistance for Areas with High Electricity Distribution Costs (AAHEDC). Are increases in the cost of electricity coming? As this blog post from Not A Lot Of People Know That points out, these costs will equate to about £500 per household by 2021. Last November SmartestEnergy highlighted the increases in the cost of electricity that users will face once the capacity market starts in earnest in winter 2017, as reported by The Energyst. Their analysis, described in a webinar, highlights the way in which the costs of the capacity auction will be recovered from businesses based on their electricity consumption between 4 and 7 pm during weekdays from November to February. They calculated that a large energy user with an annual consumption of 100 GWh could use 5 GWh during the winter peak attracting an additional charge of £1 million. This estimate of additional capacity-related costs in 2017/18 was based on a forecast of just over £41 /kW for the Early Capacity Auction. As this out-turned significantly lower, the £1 million charge would fall to £160,000 for 2017, before rising to about £465,000 with the auction price of £19.40 for 2018/19. In a poll by the firm just 30% of respondents said they had accounted for the cost of the capacity market in next year’s budget. In addition, the SmartestEnergy believes other non-commodity costs will also rise. It predicts Renewables Obligation costs will increase around 20% to £19.63/MWh for 2017/18, and that small-scale FiT costs will increase around 14% in 2017/18, and a 8% further in 2018/19. 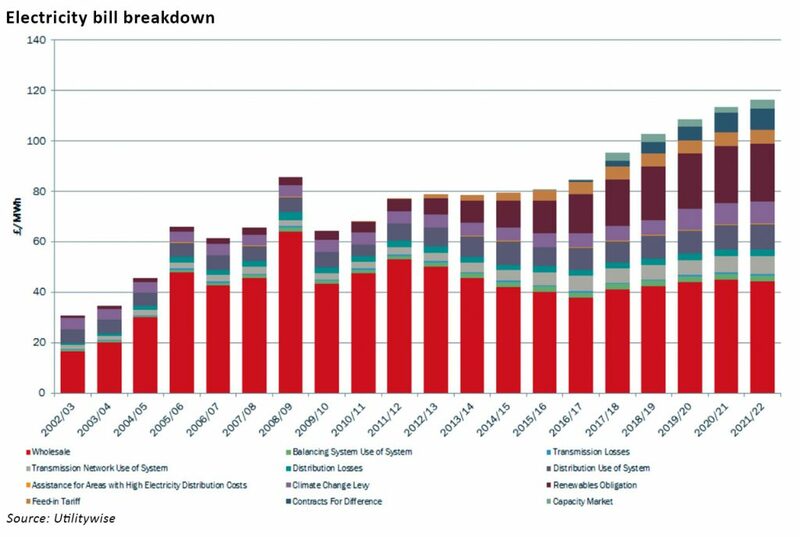 It also expects large scale subsidies via the CFD FiT to hit bills next year, going from £0.76/MWh currently to £3.78MWh in 2017/18, £6.01MWh in 2018/19 and £9.10MWh in 2019/20. This article by the business energy procurement company Cost Advice describes non-commodity costs very well, and illustrates how many of these costs are trending upwards. However, this statement entirely misses the point that the capacity auction cost is three times higher than the cost of SBR, so it is not at all unreasonable to consider that this increase would be passed on through bills. With the added pressure from increasing wholesale prices it seems inevitable that bills will be going up. Of course, price rises for consumers, particularly households, attract a lot of attention and there have been vaguely threatening statements from politicians and regulators promising to ensure “the best deal for households”. Yet according to the figures published by Ofgem, less than 1% of electricity bills is due to supplier profits, so unless the CSS data provided by the suppliers is grossly mis-leading, it’s difficult to see how suppliers can be blamed for rising bills. However, electricity pricing for retail consumers is notoriously impenetrable, with a wide range of available tariffs and charging structures which makes properly auditing the figures almost impossible. Neither the suppliers nor successive governments have been transparent with consumers about the costs of delivering secure, low carbon electricity. Complex supplier tariff structures obscure the underlying economics, and erode consumer confidence leading to widespread belief that energy companies are profiteering at the expense of consumers, particularly when customers find themselves paying high standard variable rates when better deals are available. Chaotic billing systems and poor customer service further undermine trust in energy companies. 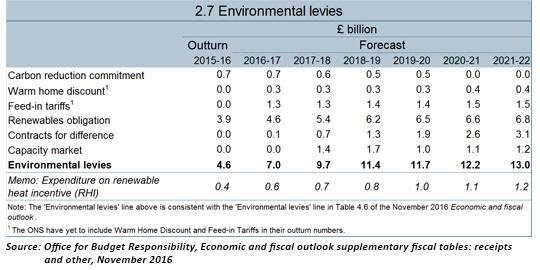 On the other hand, no government since the introduction of the EMR has been open about the actual costs of decarbonisation. The energy system now consists of layer upon layer of subsidies, with no form of generation operating without some form of additional support. On top of this is the cost of re-engineering the electricity network to cope with intermittent renewable generation which is often located far from demand centres, the multi-billion pound cost of the smart meter programme, support for large energy users, and efficiency schemes such as the ECO. Falling wholesale prices over the past few years dampened the effect of EMR costs on final bills. Unfortunately, this trend is now reversing at a time when EMR costs are also rising faster…it’s time for both suppliers and the government to come clean about the true costs of delivering low carbon electricity and wider energy policy, and allow consumers to re-build trust in the system and of course plan for the coming cost increases.